Home » Diet » 5 Excellent Non-Meat High-Protein Foods! Attempting to tackle Veganuary? Perhaps you’re starting a New Year, new you detox or cleanse, or maybe you’ve got a few awkward pounds to shift after overindulging in Christmas goodies. Well, eating more protein is one of the best ways to feel more energised, less hungry and even happier! Protein is an essential component of every cell in your body. Hair and nails are mostly made out of protein, your body also uses protein to build and repair tissues, make enzymes, hormones and other body chemicals. It’s commonly known that protein helps build bones, cartilage, skin and increase muscle size and strength. Did you know that protein has a thermic effect on the body, meaning that up to 30% of the calories consumed from eating it are burned just by processing it (compared to an average of 10% for carbohydrates)? 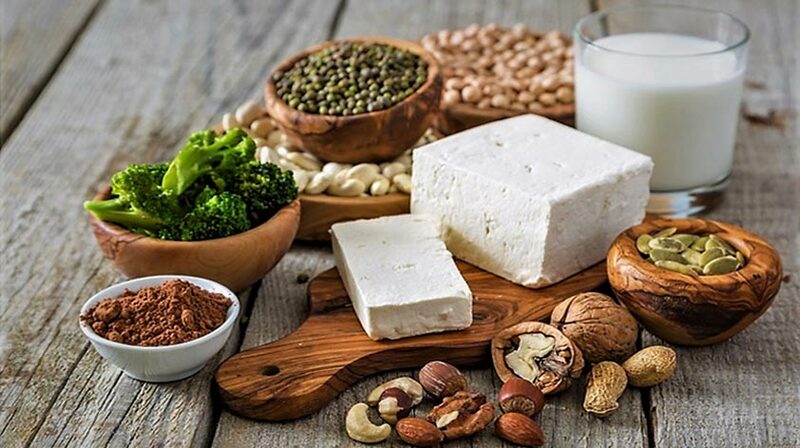 Protein doesn’t just come from meat products either, so read on for these 5 Excellent Non-Meat, High-Protein Foods! Known for it’s high protein content. Technically a seed rather than a grain, it contains up to eight grams of protein per cup, higher than the protein found in an egg! A great source of iron and zinc, minerals that non-meat eaters sometimes lack. This ancient South American power food is a super-versatile cooking ingredient and can be used to replace pasta, rice or couscous and also makes a great base for salads. Need some inspiration? Check out these quinoa recipes! Chia seeds are tiny black seeds that are a member of the mint family and come from Central and South America. Despite their tiny size, 2 tablespoons will provide you with nearly 4g of protein. Super satisfying and a great source of brain-boosting omega-3s, it’s no wonder people add them to their breakfast for an extra protein boost! For vegans, they are a great protein-rich egg replacement. Just combine a tablespoon of chia seeds with water to form a gel and add to recipes that normally require egg. Check out these tasty chia seed puddings below! Oats are among the healthiest grains on earth. They’re a gluten-free whole grain and a superb source of important vitamins, minerals, fibre and antioxidants. Research shows that oats and oatmeal have many health benefits, including weight loss, lowering your blood sugar levels and reducing risk of heart disease. Besides that they are an excellent source of protein! Once cooked, one cup of porridge serves up a notable 6g of protein. Boost your brekkie even further by topping your porridge with a handful of nuts (almonds are the highest ranking nut for protein) a spoonful of nut butter, or some natural probiotic yoghurt. Millennials are going crazy for the hummus! The combination of tahini and chickpeas make this popular dip a high protein-rich snack. Whilst there is controversy amongst nutritionists as to whether this snack is indeed a good source of protein, making it yourself from scratch is the best way to get the healthiest version. Simply blend together a can of chickpeas, 100ml of tahini, 2 cloves of garlic, a squeeze of lemon juice, 4 tablespoons of water and enough olive oil to create your desired texture. Season well and simply get dipping! Yes, vegetables contain protein too! Research suggests that spinach has more protein per gram compared to minced beef. With just over 5g of protein in a cup of cooked spinach, this nutrient-dense green is a no-brainer addition to your diet. Eat raw in salads or steam your spinach until wilting begins, toss in some pressed garlic, lemon juice and olive oil, or alternatively add lightly toasted pine nuts and grated nutmeg -hmm…scrumptious! These foods are very good sources of protein, thanks for this!